432 pages | 450 Color Illus. Whether you’re new to After Effects and want to get up to speed quickly, or already a user who needs to become familiar with the new features, After Effects Apprentice was created for you. With 12 core lessons including a trio of projects combining After Effects with CINEMA 4D Lite, you’ll learn how to tap this program’s vast potential – whether you create motion graphics for network television, corporate communications, or your own projects. 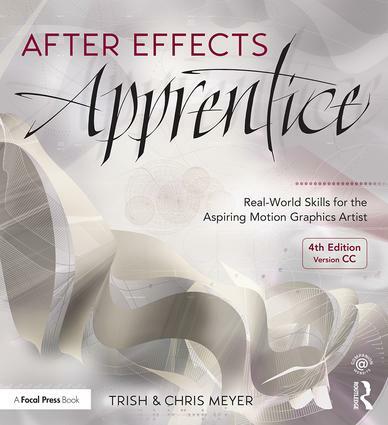 Fully updated to cover the major new features added in After Effects CC, this edition of the book presents a professional perspective on the most important features a motion graphics artist needs to master in order to use After Effects effectively. You’ll learn to creatively combine layers; animate eye-catching titles; manipulate 3D space; color key, track or rotoscope existing footage to add new elements; and use effects to generate excitement or enhance the realism of a scene. Easy to follow, step-by-step instructions guide you through the features, with explanations of the "why" instead of just the "how" behind each technique. You’ll learn more than just the tools; you’ll learn skills that you can immediately put to work expressing your own ideas in your productions. • Animate, edit, layer, and composite a variety of media. • Manipulate keyframes and the way they interpolate to create more refined animations. • Use masks, mattes, stencils and blending modes to add sophistication to your imagery. • Create, animate, and extrude text and shape layers. • Explore 3D space, including using CINEMA 4D Lite. • Use tracking and keying to create special effects, such as replacing screen displays. A companion website at www.routledge.com/cw/meyer makes available for download all exercise source material and After Effects CC project files required to get the most out of this book. Trish and Chris Meyer are principals of Crish Design, an award-winning motion graphics design studio. Two of the original After Effects users with over 20 years experience, the Meyers are highly respected authors of motion graphics books and training videos. For more, visit: www.crishdesign.com.